Ani DiFranco says she doesn't hate her new "wreckord." I'm inclined to agree with her. 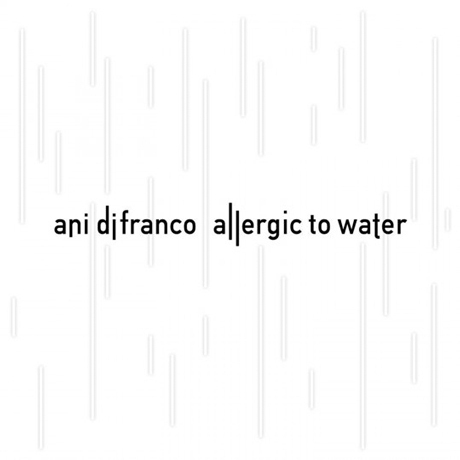 In fact, I like some of the songs on Allergic To Water, Difranco's 20th independent release in over two decades. Recorded at home and in a church while DiFranco was pregnant (and when her son was six months old), the New Orleans-based singer-songwriter not only self-produced, she self-mixed this time as well. More loose than solid as a collection, Allergic kicks off with "Dithering," a funky song about information overload and clutter that alternately hangs and briskly trudges (if you can imagine a brisk trudge). Difranco's pleasantly familiar rhythm guitar style reappears on "See See See See," an appeal to keep a romantic fire going with sweet vocals and congas (care of drummer Terrence Higgins). The title track argues metaphorically for empathy and compassion, similar in sentiment to the opening poem/song "Compassion" on Lucinda Williams' latest (the point being that you can't always imagine what someone else might be up against). Elsewhere, Difranco is characteristically intimate, perhaps even more so than usual: "Happy All The Time" is a little rambly, but Difranco's vocals (and mouth trumpet hook) are endearing, while "Harder Than It Needs To Be," a grower of a soulful blues ballad with sousaphone (played by Matt Perine), is so frank and direct its nearly uncomfortable — the kind of honestly Difranco's audience has grown to expect from her. Ani Difranco Which Side Are You On?